You can reach the hotel from Schiphol airport by different means of transport. By taxi. The costs are approx. €45 and it takes approx. 25 minutes. With the Connexxion Airport Hotel Shuttle. Costs are €17,50 for a single ticket, €28 for a return. Tickets are available from their office at Arrival Hall 4 at the airport, or from the Tourist Information Office at Arrival Hall 2 at the airport. By public transport. With bus 397, stop Museumplein/de Lairessestraat. XO Hotel Inner is located across the street, behind the Concertgebouw (Concert building). By public transport from Amsterdam Central Station you can take tram 12. The nearest stop to the hotel is Museum Square. 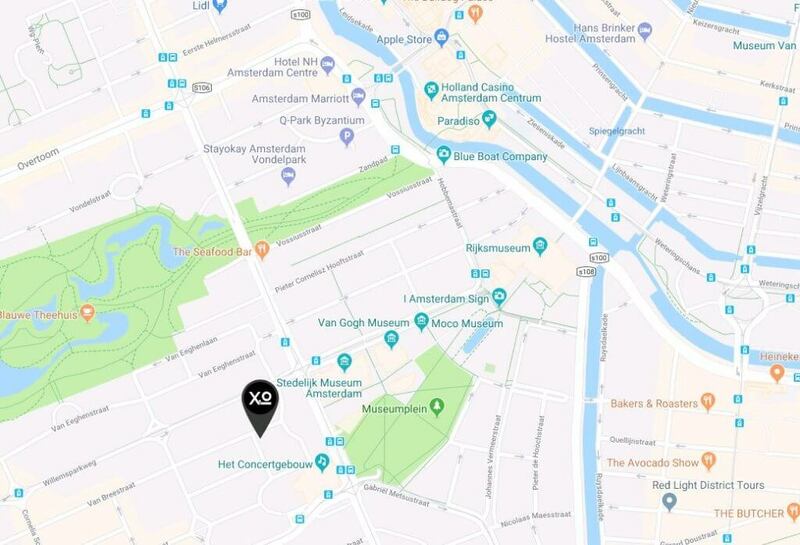 XO Hotel Inner is located across the street, behind the Concertgebouw (Concert building). The hotel is situated in the centre of Amsterdam. Visit Google Maps to plan your route to the hotel. When you are coming by car, you can park at the Q-Park park house at the Museum Square, costs are approx. €50. Alternatively you can park in one of the surrounding streets for approx. €40 per 24 hours. From the hotel you walk to the tram stop Museumplein, from there you can take tram 12 and get out at the stop Scheldestraat. From the Scheldestraat it is an approximate 5 minute walk to the RAI. From 1 January 2018 the LEZ (low emission zone) starts in Amsterdam for coaches and busses older than 1-1-2005. This means that it is not possible to drive inside of the Ring A10 with a bus or coach older than 2005. This is also valid for busses and coaches with a foreign license plate. It is not possible to ask for an exemption. If you are driving a bus/coach build after 2005, you are allowed to drive within the Ring A10. For more information, you can check site of Iamsterdam.